In this day and age, we’re always connected. If we’re not using our smartphones to communicate with each other, then we’re using our tablets. If it’s not our tablets, then it’s our computers. One byproduct of all this is that we need ubiquitous messaging. We want our messages, our conversations and settings to move between devices seamlessly, meaning we can start a conversation on our iPhones and finish it on our computers. With iMessage, Apple is working hard to achieve just that, but as is often the case with iOS, it’s a Mac-only affair right now. Macs have their own version of iMessage installed, but that has its own limitation in that it can’t send SMS messages like your iPhone can. If you want to be able to do that, then you’re going to want to look at jailbreaking and in turn, Remote Messages 3. Remote Messages 3 is a good way to send and receive messages on a computer or any other platform that has a Web browser, using your iPhone as a conduit for those messages. iMessage and SMS are equal because of that, meaning there are less limitations than with Apple’s own Mac-only offering. Using Remote Messages not only can you send and receive SMS messages / iMessages, but you can do it from any machine with a Web browser, too, and yes that includes Android as well. 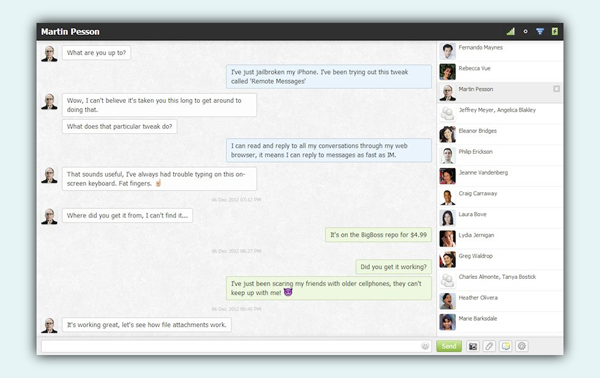 The list of Remote Messages 3 features is a lengthy one, so that $3.99 price tag looks a little more palatable already. You’ll get the aforementioned SMS / iMessage capabilities as well as typing notifications, camera roll access and contact pictures. In fact, because the tweak basically acts as a Web server on your phone, it can even send information such as battery status and Wi-Fi signal too. While Remote Messages has been around in different flavors for a while, this third version adds support for iOS 7 and devices equipped with ARM64 chips. There’s plenty on the list of supported features, so we’re sure you’ll find something to tickle our fancy. And furthermore, you can configure Remote Messages on your iOS device from the native Settings app. 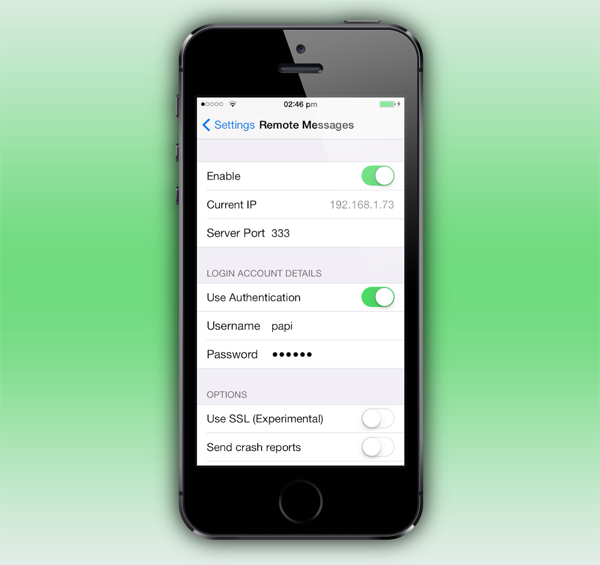 Step 1: Install the tweak from the BigBoss repo, and then navigate to Settings > Remote Messages. Step 2: Create a user account with a username and password of your choice. Step 3: Use the Enable toggle in the settings interface to turn on the Web server, and then connect to Remote Messages via your device’s IP address and port. It’s really that simple. With iMessage unlikely to come to Windows any time soon, and even the Mac not getting SMS support in its own Messages app, tweaks like this certainly have a place in the world. 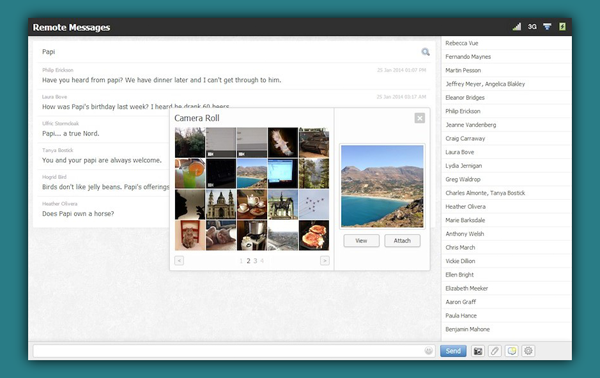 If sending and receiving messages on a computer is something you requires for whatever reason, then this may well be $4 well spent. The tweak is available to download from the BigBoss repo.